So, before I even start on Macbeth and the incredible theatre at which we saw it last night, can you just look at that picture?!? Who would believe this is in England? 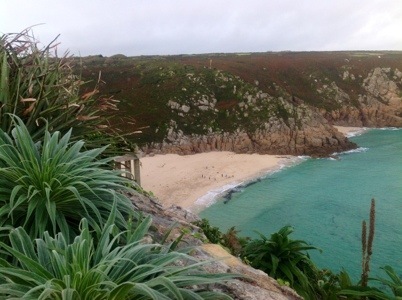 They don’t call it the Cornish Riviera for nothing, that’s for sure. I took this pic from the steps of the theatre. 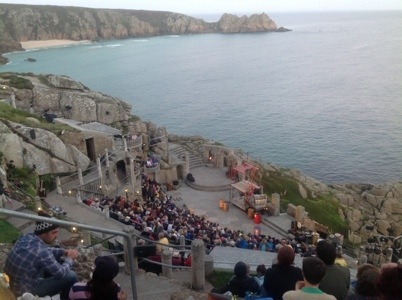 Which sounds weird, I know, but not when you realize the theatre is outdoors, carved into the side of a cliff. I am sure there is no more impressive theatre anywhere in the world. And it is made more so by the fact that one woman, Rowena Cade, spent from 1931 to 1983 planning, financing, and building this theatre almost single-handedly. It is incredible; seats carved into the side of the rock, a stage that looks like something constructed by Romans, and the unparalleled view of the rugged cliffs, turquoise water, and sandy coves behind it. So, imagine Macbeth here, at dusk, in this setting – King Duncan entering stage left over the rocks, regal on horseback, the cliff-side battle as Macbeth and Banquo vanquish the Norwegian foe, and the weird sisters on the other side of the stage, appearing on the grassy mound with the ocean in the background…perfect! That’s what I wanted. But that’s not what I got. They messed with it. Macbeth had on a red jumpsuit, and Banquo was in camo gear. Macduff reminded me of an Argentinean rebel soldier. There were no witches. Now, I’m all for making Shakespeare current. And I’ve seen lots of productions with a modern set, and enjoyed them. But when you’ve practically got a castle on the side of a cliff as your natural set, doesn’t it just scream for a traditional rendition complete with elaborate period costume? I think so. Why would you mar this visual miracle with scaffolding, pallets, and oil drums? Why? Bob thinks you should be reviewing for the Globe and Mail! Such is the caliber of your writing! Unbelievable setting. And, the cove does look Mediterranean—but is it warm? Thank Bob for the compliment! I’ll have to send you the links to some of the actual travel articles I’ve done. And no, it’s not warm. But warmer than everywhere else in Britain!